December 1958 - Oh Boy! NME announces the “Oh Boy!” stage show is to go ahead for a week in January 1959. TOP-SELLING British recording group, Lord Rockingham's XI, makes its first public appearance on Sunday, January 25, when the long-projected "Oh Boy!" stage show opens for a week at the Commodore Theatre, Hammersmith. Producer Jack Good told the NME: "Although the show has yet to take shape, I hope that Cliff Richard and all the regular members of the "Oh Boy!" TV company will take part." Further guest bookings for the Saturday evening TV show have been announced. Terry Dene's date has been put back one week to January 10, and Mona Baptiste appears on January 10 and 17. Actor William Marshall has been engaged for December 27 and January 3. Good says Marshall has a deep voice resembling Paul Robeson and sings "up-tempo spirituals." Neville Taylor's supporting group, The Cutters, will have a new line-up from tomorrow onwards. Wilf Todd and Basil Short have dropped out and are replaced by Al Timothy and "Shake" Keene. Cliff Richard turns in an even more than usual sexually suggestive performance in this show, while impersonating his idol Elvis Presley, which evokes some strong criticism in the NME. the following Friday. The John Barry Seven made their final appearance. It's possible they would have returned in 1959, but this was ultimately prevented when they signed to appear exclusively on BBC's Drumbeat series. Cliff was unable to appear at the Regal, Colchester, as he was suffering from an acute sore throat. Singer Vince Taylor deputized at short notice. Organist Cherry Wainer also fell ill and had to cancel the booking. During early December Cliff collapses with exhaustion. Performing twice-nightly on the variety circuit, rehearsing for “Oh Boy” during the daytimes as well as filming “Serious Charge” at Borehamwood, Hertfordshire, takes its toll on Cliff’s health. Angry at the apparent exploitation and overworking of his son, Cliff’s dad sacks Franklyn Boyd his manager. THIS columnist has always high praise for the "Oh Boy!" TV series. But producer Jack Good must be held responsible for permitting the most crude exhibitionism ever seen on British TV - by Cliff Richard last Saturday. His violent hip-swinging during an obvious attempt to copy Elvis Presley was revolting - hardly the kind of performance any parent could wish their children to witness. Remember, Tommy Steele became Britain's teenage idol without resorting to this form of indecency. If we are expected to Believe Cliff Richard was acting "naturally," then consideration for medical treatment before it's too late may be advisable. While firmly believing Cliff Richard can emerge into a top star and enjoy a lengthy musical career, it will only be accomplished by dispensing with short-sighted, vulgar tactics. Finally, ABC-TV has a reputation to uphold and an obligation to viewers. Its first duty is an order to producer Jack Good to forbid any repeat of last Saturday's disgraceful antics. CLIFF RICHARD has been booked to appear in a cabaret spot at London's Lyceum Ballroom - the biggest in the West End - for six nights from February 2. This is the first time in recent years a leading disc artist has been featured at this top dancing venue. This follows negotiations with Mecca Ballrooms, who originally wanted Richard for cabaret at the plush Cafe de Paris in November. That date could not be fixed due to Cliff's heavy commitments, but it is now hoped he will be able to appear at the Cafe de Paris in March or April. Cliff continues to appear in ABC-TV's "Oh Boy!" until the end of the year. After that, his appearances will be at irregular intervals. The only one at present settled is for January 17. Next month, Richard also heads an eight-day package booked by Gerald Cohen, to tour Star Cinemas in the North of England. The tour will be split into two parts - three days from January 12 and five more days from January 19. Towns he will visit include Wombwell, Dewsbury, Leeds, Pontefract, Scunthorpe, Newark and Burnley. On January 24 he appears at the Rialto, York. Cliff's Sunday concerts continue at Wolverhampton Civic Hall (January 4), Guildford Odeon as well as the NME Poll Winers' Concert at the Royal Albert Hall (January 11) and Romford Odeon (January 18). He also appears at Manchester Free Trade Hall (January 10) and the Dome, Brighton (January 16). Hundreds of teenage fans were disappointed last Sunday evening when Cliff Richard was unable to appear on stage at Colchester Regal. He was suffering from an acute sore throat. Vince Taylor, who guests in "Oh Boy!" tomorrow, deputised. Also absent from the bill through illness was Cherry Wainer. The Tracy Sisters stood in at short notice. MARTY WILDE and his manager, Larry Parnes, have patched up the quarrel which caused Marty to ask for release from his contract. Marty told the NME: "Everything is straightened out now. I was really upset about leaving the "Oh Boy!" show, but Larry and I have had a discussion, and have agreed to co-operate fully." Following this, Larry Parnes has had talks with Jack Good and ABC-TV, and now expects renewed dates for Marty on "Oh Boy!" commencing at the end of January. GLEN MASON has been booked for every edition of the "Black and White Minstrel Show" which, following its return on December 20, will be a monthly series on BBC-TV. Norrie Paramor will appear with the Big Ben Banjo Band. George Inns produces and is at present negotiating for Benny Lee and Rosemary Squires to continue in the series. Bill Forbes makes his second “Oh Boy!” appearance. Glen Mason makes his only appearance in the series and is immediately snapped up by the BBC to appear in every episode of its new “Black and White Minstrel Show” beginning later in the month. A special train runs from Birmingham to London so fans can see the show live. The “Oh Boy!” LP is officially released this week. It had been recorded live at Abbey Road Studios on Sunday 19th October 1958. The album, which. surprisingly did not chart, was reviewed, albeit briefly, in the NME by ‘Alleycat’ on 12th December 1958, who on the same page had lambasted Cliff’s “Oh Boy!” performance the previous Saturday (6th December) as “crude exhibitionism". Many well-known stars have penned titles featured on Jack Good's "Oh Boy!" album presented by Columbia - including Bobby Darin's Early In The Morning" (performed by Cliff Richard), plus tracks by Cliff of Jerry Lee Lewis' "High School Confidential", Bobby Day's "Rockin Robin, and Melvin Endsley's "TV Hop". 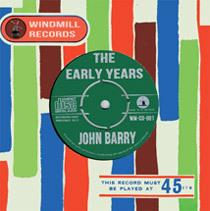 Jack Scott's "Leroy" is sung by Neville Taylor, aided by the Dallas Boys and instrumental John Barry Seven group, a version of of Little Richard's "Hey, Hey, Hey, Hey," sung by Cuddly Dudley; also a combination of Cliff Richard and a vocal group led by Neville Taylor offering "I'll Try" (from the pen of Conway Twitty) and "Pancho", John Barry's own composition, presented by The John Barry even. Cliff Richard rents his own central London flat at 100 Marylebone High Street, North West London. Within weeks the spacious six-roomed apartment quickly becomes an occasional ‘crash pad’ for his backing group The Drifters and other members of the "Oh Boy!" cast who can't get to their homes in the sticks after gigs. Its location was ideal for Cliff to attend “Oh Boy!” rehearsals and other London stage venues and in addition it was within easy walking distance of his close friend Cherry Wainer’s flat and the famous Lotus House Chinese restaurant (where he often dined) in the Edgware Road. Cliff’s mother and elder sister maintained the flat while Cliff was away working on whistle-stop tours around the country. The King Brothers (right) make their only appearance in the series, replacing the Dallas Boys who appeared on the rival "6.5 Special” pop show at the same time on the BBC. The BBC air the last “6.5 Special” pop show, which had been broadcast at the same time as Jack Good’s “Oh Boy!” in direct competition at 6pm on Saturday evenings. The hour long “Oh Boy!” Christmas special planned in November for this date did not materialize. During 1958 Cliff Richard had appeared in 13 of the 16 shows broadcast since 13th September 1958 and topped the bill on many of them. However he would only make 7 appearances during the remaining 22 shows broadcast from January to end of May 1959 due to a gruelling schedule of live appearances. He would appear on 17th & 31st January and then not be seen for five weeks until 7th March. He would make just 4 more appearances- 28th March, 3rd May, 23rd May, and the last show on 30th May, which is the only surviving one where Cliff is featured.